The Ethiopian Army wantonly massacred 51 civilians in Jama’ Dubad village near Gashamo town on June 5, 2016. The army indiscriminately opened fire on unarmed civilians in the village centre, shooting everybody in sight, not sparing women, children or the elderly. After the army started the massacre, many villagers run to the local mosque, hoping that they may be spared there. However, the Ethiopian army followed them there, shooting and killing them all. Then, the army torched the village, destroying all property, food and the water supplies of the village. Many wounded civilians who managed to run away to the fields, are scattered and hiding in the fields. Some of the villages and many children are still unaccounted for. In addition, the Ethiopian army has abducted more than ten elders whose whereabouts are still unknown. The Ethiopian army has sent reinforcements and are currently occupying villages along the border. This is an indication that the army intends to commit more massacres in order to create fear and stem any reaction from the local communities. Just two months ago, the Ethiopian army massacred civilians in Dhaacdheer and Gaxandhaale villages near Galadi town in Wardheer region, killing scores of civilians. In February 2016, the Ethiopian army and the Liyu Police militia destroyed Lababar village near Shilaabo, killing more than 300 civilians and destroying the whole community in order to clear areas near the Jeexdin (Calub) Gas fields. In similar aggression the Ethiopian army killed many civilians near Bur-Ukur, Ferfer, Beledwayne and Hudur areas at the end of last year. The Unrepresented Nations and Peoples Organization (UNPO) joins the ONLF in strongly condemning the actions of the Ethiopian army and calling upon the international community to hold the Ethiopian Government accountable for these actions, demand that such repressions are halted and take Ethiopia’s poor human rights record into account when engaging in trade or other exchanges with its authorities. When servitude pays! 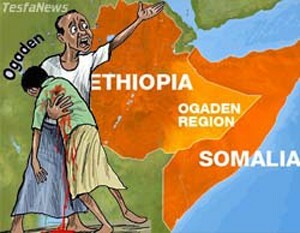 Genocide and ethnic cleansing are committed in Ogaden by the mercenary regime soldiers and the world keep giving deaf ears. This is the most beautiful video clip I have ever seen. Do you have more like this I would love to see them all .TPLF is taking control of the situation and protecting their interest. So what are you going to do about it? Ethiopia will never ever make same mistake like in the past with Egypt and its shaebia and jebha slaves. There is no hide and seek game with EPRDF and the gallant Ethiopian Army.The gangs in Asmera and its illiterate blind supporters must accept the simple fact and reality that Ethiopia is big ,strong and powerful in the region and in Africa.if you go against this,it is same like self destruction.you will achieve nothing to change the status quo apart of wasting your time and resources.Admit Ethiopia is strong,admit Ethiopia is powerful,admit Ethiopia is progressing under the leadership of EPRDF ,then you are able to evaluate the current condition of your nation.my message to the Eritrean people is simple and precise to the point ,your nr.1 enemy is the gangs in Asmera nothing more nothing less. Alliance between Eritrea and Ethiopian people, organizations is a cornerstone for peace and prosperity of both countries and the region. The Isaaq clan of the Somali people are notorious for their blood vendettas and swift revenge, they will avenge their kinsmen of this I am sure. Eventhough Somaliland’s government have urged restraint by the Isaaq clan it is without doubt that the president of the Somali region of Ethiopia have made some powerful new enemies in addition to previous ones such as the Ogaden clan which he have slaughtered on mass for years. As for the Ethiopia Somaliland relationship it will remain but among the Somaliland people the perception of Ethiopia as a friend might now change hopefully. Somaliland should join the fight against Ethiopia and accept that woyanne ruled Ethiopia is the enemy of all people in the horn of africa. Ethiopia anf Somaliland’s relationship has never been stronger. Sorry to inform you people of the truth that hurt you. I really dont know why shabo waste money on 100 soliders that can barley fight. ONLF has been crushed ever since they killed innocent people ten years ago. Lost all the respect of locals and out gallent force has been chashing them all the way to Kenya. There is no more safe haven in the horn. We will wait till shabo build the other 400 or so and march in Asmera if you get out of line. Full notice. ONLF are in Mogadishu and their bases is all over Somalia especially in Jubaland near the port of Kismoya in southern Somalia. ONLF are sons and the daughters of every single Somali from Djibouti to all the way to Northern Eastern Kenya and the struggle waged by the ONLF against the Dogs TPLF is well support by the people of Somalia and Djibouti and all the crimes TPLF committed against my fellow Somalis in the Ogaden and the Oromos bro/sis will not be forgotten, TPLF will be brought to justice. Hamsen and shewa Amhara has one thing in common, fukera and pride. I think they are teaching you their bad things. We only know how to get results without talking. Jubaland has three areas, low middle juba and gedo with Ethiopia liyu police teaching them how to hold an AK. If we go to Yemen to bring Andargachew, Somalia and Eritrea, imagin. So who is doing the “fukera”? Ay sintiku. Yiu aee a jock. you brain child shorty rubish tigrey man. let me tel you,abouth this video clips that you are hapy about.these dead body people you see from the video, are people you called them your alliance. i mean clan based somalilanders or snm terrorist,belongs to isaaq clan who allso live both somali region in ethiopia and northern somalia.and killers are your mercenaries forces called new /lypolice lead by abdi elay,the so called president of somali region of ethiopia. i am sorry to say they are your allience , but that is what got from your little barin child,tigrey man. and the reason they are killed, b/c lypolice kills anyone including their family,who think that they are treatening their bad bussines w/t woyano. and these nomadic clan based somaliland isaaqs, who are in the dead body from the video they are some times refuse to fellow dabaqoodhi/lypolice orders.b/c the pastoralist nomadics some times go to live somalia some times somaliregion in ethio. and they not fellow woyane or new police rulles. that is why they are target sometimes. no one is your allience.your only allience in somalia are groub of warlords paid by america and C I A, and alshabaab terrorist and some unedicated people who just transforming their knowledge and soon becoming your enemy. these people are your alliance in somalia, that is the true. again let me explain you,you shorty litle brain child tigrey man. the so called somaliland and puntland you allways singing like the new born baby. puntland is party of somali,they are just autonomy region, just like tigray regionof ethiopia,and they are want more united somalia,but they are just waiting stability of the capital. you fagy little b….t shorty tigrey brain child hopeles man. somaliland means land of somalis, wich means including northern kenya to jabuti eastern ethiopia and somali republic. from the begining, the name called somalilnd is wrong and disputed by the way that is calling now somaliland.but the people who created or made this so called somaliland, the snm rebel groub, they are fooling their clan, the isaaq clan, whose live middle of former british somaliland. because many people of this clan are unidecated or militarily they were forced to accept snm plan to make somaliland. anyway the people who made somaliland in 1991 are snm terorist members belongs to isaaq clan , who are suported by minguste heile maryam regime to distabilese somalia,and tplf keeping mingestu policy to suport snm terrorist and distabilese somalia until today. the so called somaliland is one of three somalilands colonised and divided by europians. they were italian somaliland wich is southern somalia capital muqdisho. second somaliland made by white people are british somaliland,from northern somalia, capital hergeisa. and tirth somaliland were french somaliland, and that is djibouti now. so those story is over now,because two of three are formed united republic somalia in 1960 and these were british somaliland and italian somaliland,and french somaliland is indepedent country and that is djibouti now. but the 1991 somali republic colapsed, and snm terrorist groub from isaaq clan who serving ethiopian interest declared somaliland indepedence, of former british somaliland. but when snm rebel groub tried to declare somaliland, they forget one thing, and that thing was, that the former british somaliland were not only lived by isaaq clan, but former british somaliland or northern somalia lives by five clans, and isaaq clan are one of these five clans. and those four clans are dont belive so cal somaliland, at all , but one somalia. dont forget allso the all isaaq clan people allso dont belive somaliland,the only snm terrorist members from isaaq clan are forcin people to make separetion of somali people, who serving only ethiopian and outside ajenda. the ather 4 clans who lives so called somaliland alongside isaaq clan and dont believe somaliland anwayz their names here. wersangeli clan dominated south east of somaliland. samaroon clan dominated awdal region,from north west of somali/ former british somaliland. ciise clan dominated allso north somaliland of somalia, area between djibouti and somalia, ciise clan allso dominated djibouti, presdint Ismail O Geele of djbouti allso member of ciise clan. my self i am f from north somalia and i believe one somalia, i dont know what is somaliland. you ediot brainchild shorty tigrey man. and snm groub from isaaq clan are only using clanisim to serving colonial ajenda of westen and woyano . but the ather people from ather clans and including normal people from isaaq clan are reject snm terrorist separetist clanist groub suported by weyano/western to weaken divide colonise and destapelise somalia. that will be no sucseed, you weyano brainchild shorty people. Ethiopia’s policy of killing an entire village of people because they can’t find one suspect who happen to be from that village sure is a strange and uniquelly Ethiopian practise of barbarism. I condemn in the harshest terms the crimes against humanity being commited by Ethiopia and its para military forces on in the Somali Region of Ethiopia. Hey you idiot calling yourself Somali man. Shut your stinkig mouth. And stop insulting Tigrai people and Isaak people. Debate here like a civilised person and offer the forum something other than your illiterate jibberjabber nonsense.